The railway traction motors market in North America is consolidated to a certain degree, with the five leading players collectively accounting for a share of over 55% in 2015. These players are ABB Ltd., Bombardier Inc., Mitsubishi Electric Corporation, Alstom S.A., and Siemens A.G. Transparency Market Research states that considering the current trends in the railway traction motors market in North America, the market shares of some of the key players are likely to undergo significant moderations during the course of the forecast period. “In order to retain their lead position in the market and gain a larger share, companies have been focusing on a number of strategies, including investment in research and development, enhancing product offerings, expansion of sales and marketing networks, acquisitions, emphasizing on emerging markets, and synchronizing with upcoming technologies and companies,” the author of the study observes. 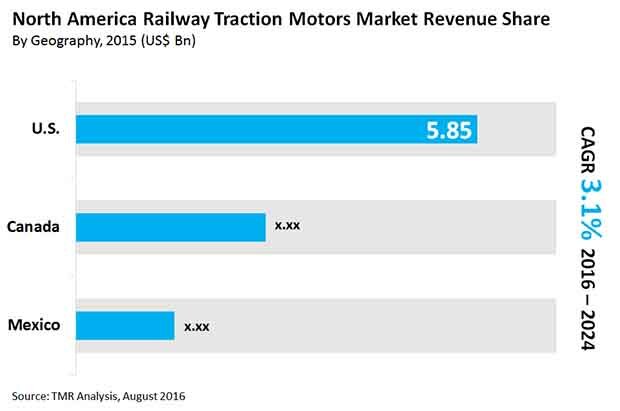 The opportunity in the North America railway traction motors market is expected to rise from US$10.05 bn in 2015 to US$13.21 bn by 2024, reporting a 3.1% CAGR therein. By type of motor, the market is led by alternating current traction motors and the segment is projected to account for a revenue share of over 50% by 2024. This segment is also poised to be a highly attractive market with a 3.5% CAGR from 2016 to 2024. By application, diesel-electric locomotives will retain their lead in the North America railway traction motors market throughout the forecast period, followed by diesel locomotives. The segment of electric locomotives, on the other hand, is projected to register a considerable CAGR from 2016 to 2024. In terms of country, the U.S. accounted for the leading share in the railways traction motors market in North America and is projected to generate just under US$8 bn by 2024, registering a 3.5% CAGR during the forecast period. The ongoing investments in research and development have significantly driven the railway traction motor market in North America. “The development of regenerative brakes, hybrid locomotives, and transformers for voltage modulation, among others, is a result of rising investments in innovative railway technologies,” the lead analyst states. A steady rise in railway passenger traffic in North America has compelled rolling stock manufacturers and railroad companies to focus on the modernization of passenger railcars. Looking to improve overall comfort, enhance performance, minimize quality issues and design errors, and reduce need for frequent maintenance, companies across the region have already initiated the process of modernizing passenger rail cars. This modernization is expected to boost the demand for improved rail equipment such as traction motors. The only restraint OEMs in this market face is the lengthy timeframe for manufacturing and delivery. Moreover, replacement requests from end users are exceptionally low and this adds to the wait. However, the impact of this deterrent on the North America railway traction motors market is projected to be medium over the forecast period.